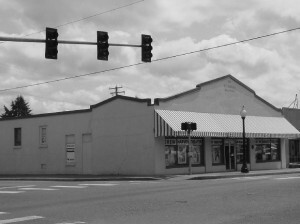 Although considerably altered, this false front building is one of the oldest commercial buildings in Yelm, and one of the last of its style remaining in Yelm. Originally used as a blacksmith shop, the building was once occupied (in the rear) by the Yelm Irrigation District Office. The irrigation system, completed in 1916, ranked as one of the best small systems in the state that eventually irrigated 7,000 acres. 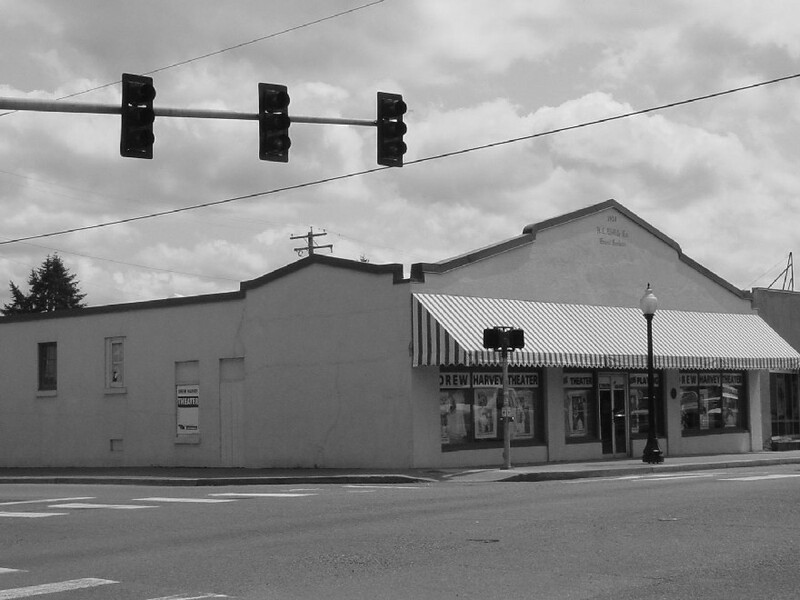 From the 1920’s through the 1940’s the building housed the realty agency of Lewis Cochrane. Cochrane also served as Yelm’s postmaster from 1934 to the early 1940’s. Other occupants of the building have been a fix-it shop, bakery, the Barnard’s Boot & Saddle Shop (from 1961-1986) and tack and feed store. Although considerably altered, the structure is representative of commercial vernacular false front buildings of the period. Note the rustic/dropped siding, multi-pane windows and the low pitched gable roof. Alterations include shingled cladding on the false front, removal of original porch roof and columns that once spanned the entire front façade, removal of original multi-pane front door, and the covering of the original windows. A sign reading “Yelm Realty- Real Estate Insurance Loans” once adorned the false front. 202 Jefferson Ave. N. W.
This simple, vernacular church is one of the oldest religious centers in Yelm. 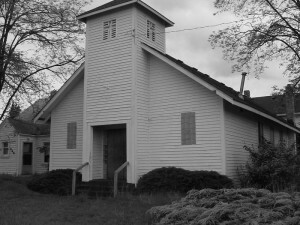 The Yelm Prairie Christian Center was originally the Assembly of God Church that was organized in 1919 by Elder J. S. Secrist of Olympia, with twenty members on the original charter. The church was built in 1923, the parsonage in 1933, and the addition in 1939. The two-story rear addition currently houses the church and pastor offices and youth classes. An intact vernacular church that originally had a simple rectangular plan with a central bell tower. A two story rear extension was added years later. Note the unique glass block windows on the front façade. Alterations to the main building consist mainly of interior modeling. Although extensively altered, this commercial vernacular building has retained its unique curvilinear roofline and “Tudor Arch” window design. 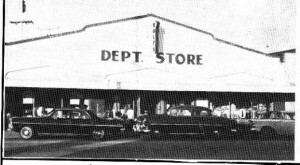 From its construction in 1924-25 until its closure in the 1960’s the building was occupied by the H. E. Wolf & Company store, in Yelm’s leading department/grocery store during the period. 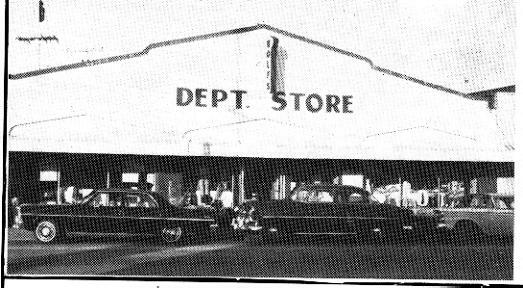 Initially a general store, the business expanded under Hal Wolf, Sr., and in the 1950’s became a department store as well, The store was affiliated with the Red & White stores, an independent store owner’s association. In the 1960’s the store was abandoned and all operations moved to the new Wolf store. Although extensively altered this commercial vernacular building has retained its unique curvilinear roofline and “Tudor Arch” window design. The storefront windows and front entry have undergone several changes. The multi-pane transoms have been covered over. The original fixed sash storefront windows and two recessed entries have been removed. Signs once adorned the front façade read “H. E. Wolf & Company, Yelm, Washington, The Red & White Store” and “H. E. Wolf & Company General Merchants.” Other changes include the removal of a cloth awning that once extended the entire front façade, which was later replaced by a metal one in the 1940’s. Gasoline pumps were once located in the front of the building. Side façade doors and windows have been covered over. The interior has been extensively altered as well. The building, representative of the post World War II commercial utilitarian architecture, was constructed at a time when both the city and county were experiencing considerably growth and economic expansion. The increase in population necessitated the need for expansion of governmental services that resulted in the construction of this multi-purpose government building. The building was originally occupied by the police station, city hall and fire station. Eventually the city hall (in 1975) and the police station (in 1986) moved to other locations. The building in currently occupied by Station No. 21 of Thurston County Fire District #2. 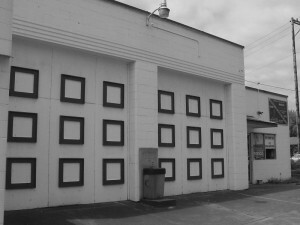 An intact commercial utilitarian building that exhibits minor Art Deco style influences with its flat roof, sharp edges, and string course above the garage doors. Minor alterations included side and rear additions. A fine example of a commercial utilitarian style building constructed during the boom peiod immediately after the destructive fire of 1924 when most of the business district was destroyed. The building was constructed by Dow R. Hughes, postmaster of Yelm from 1907 to 1934. Hughes was also a merchant and livestock breeder. Hughes moved the post office to the east end of his new building where it stayed until 1968. He sold the building to James Mosman in 1930. 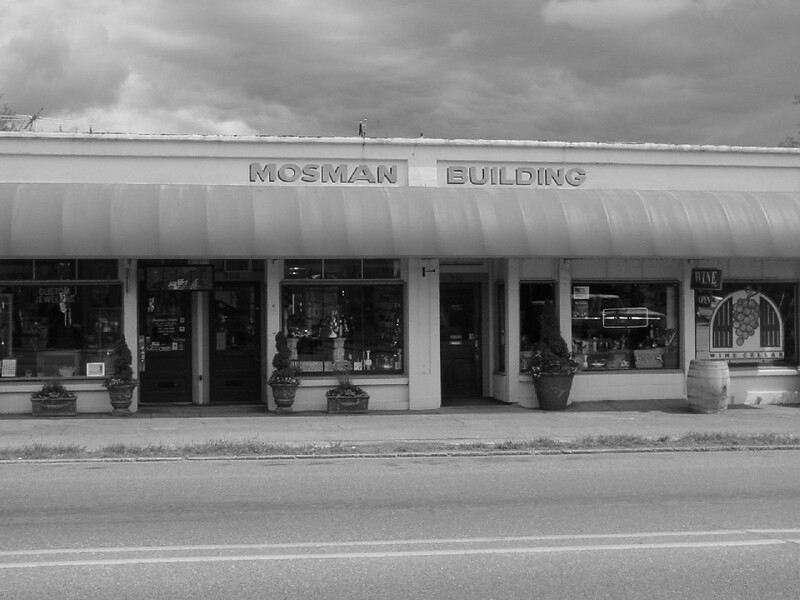 Mosman had arrived in Yelm in 1892 and established a general merchandise store and livestock breeding business, as well as serving as postmaster from 1903 to 1907. 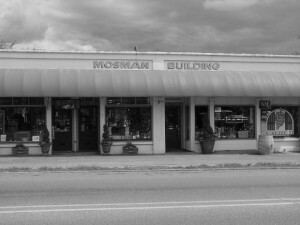 Mosman’s Real Estate & Insurance has occupied the west end of the building since 1930. 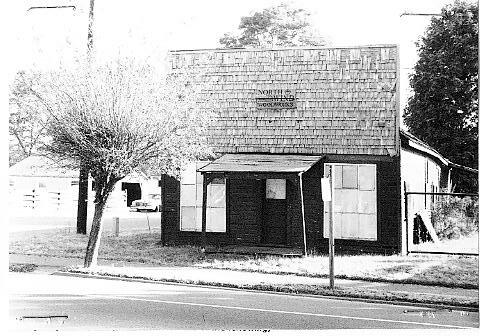 In the early years the middle of the building was occupied by a beauty shop and later a jewelry store. 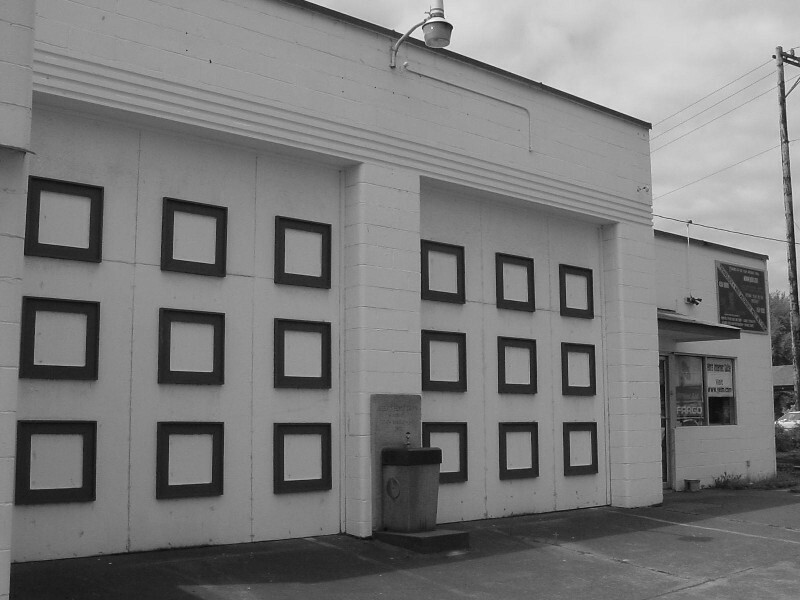 An intact commercial utilitarian building with a simple rectangular plan. Minor changes include a contemporary awning which replaced the original metal one. The original windows and recessed entries have remained intact. One of the oldest Bungalows in Yelm, this residence was built during the period when Yelm was experiencing substantial development and population growth. Builder and initial occupant William Price operated a barbershop in the Stop Inn/Lounge (White’s Tavern) building. A fine intact Bungalow with an unique front porch roof. Little has been altered to this residence except the removal of the chimney and the installation of a new front door. 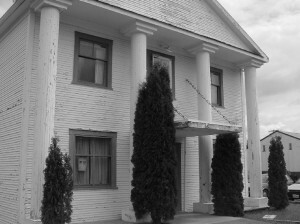 An impressive example of a Greek Revival building; the only one of it type in Yelm. An imposing building with a large classical pillars that is usually found in larger communities than in Yelm where it’s a popular style for lodges/fraternal orders. The hall was built (in 1926) during the reconstruction boom period that was precipitated by the fire of 1924 which had devastated most of Yelm’s business district. An impressive example of a Greek Revival building. The building’s overall symmetry is typical of this style. Note the symmetrical fenestration, the narrow clapboard cladding, impressive classical pillars and the chain connected canopy over the front entry. Everything is intact except for the moving Masonic insignia originally located on the pedimented gable end to the second floor façade. Although extensively altered both buildings have retained their one story commercial vernacular style and their front façade parapets. The construction of both buildings was part of the reconstruction of the business district after the devastating fire of 1924. The Stop Inn restaurant was originally White’s Pool Hall, becoming a tavern after the repeal of Prohibition. A barber shop was also located in the building. 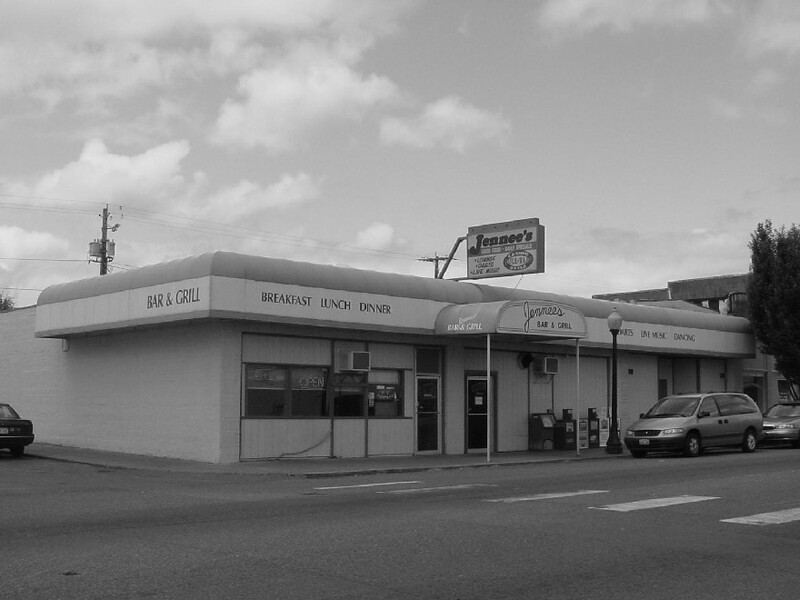 The Stop Inn lounge was initially the business office of Puget Sound Power & Light, and later Hendricks Jeweler’s. The Stop Inn was originally two separate buildings but due to interior remodeling it has become one commercial building. Although extensively altered both buildings have retained their parapets, basic rectangular plans, and the one story commercial vernacular style. Alterations include the replacement of the original fixed sash storefront windows, multi-pane transoms and recessed entry. Vertical board cladding covers part of the original window. The entire storefront on the west end of the building (the lounge) is boarded over although the original entry remains intact. Although the first story of this unique two-story commercial vernacular building has been considerably altered the second floor has retained it Tudor Revival form. The building was built during the early years of the reconstruction of Yelm’s business district after the fire of 1924 which had devastated most of the business district. 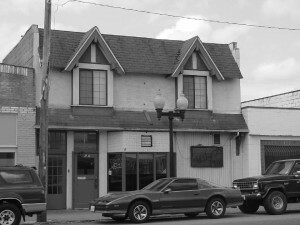 The building was initially occupied by the Dain and Pollman Restaurant, becoming the Green Lantern Tavern after Prohibition was repealed. A barber shop was located at the west of the building that currently is boarded over. The second story has been occupied by professional offices and apartments. An unique, two-story commercial building with minor Tudor Revival influence on the second floor. Note typical steeply pitched gabled dormers, mansard roof, and stucco siding. The first floor, however, has been considerably altered. The original multi-pane transom windows have been covered over. The portion of the building that has vertical board siding originally had a recessed entry, fixed sash window, and multi-pane transom. “The Green Lantern” sign on the second story façade has been removed. A fine, intact example of a 3-story fraternal building (two-part commercial block). It was the only commercial building in Yelm to survive the 1924 fire that devastated most of the business district. The International Order of Oddfellows occupied the building from its construction until the 1970’s. Constructed with the use of volunteer labor by Yelm Lodge No. 320, the hall was financed by the sale of certificates (bonds) to its members. It has also been the home for the Royal Neighbors of America (1923), the Moose Lodge, and various community dances and movies. Businesses have occupied the first story for many years. This fine, three-story fraternal order building is a two-part commercial block. This style is a horizontal division between the first and upper floors into two distinct zones which reflects the differences in use inside the building rather than on the exterior façade. This form is typical for fraternal halls during this period. Note the overall balance, symmetrical fenestration, basic rectangular plan, distinctive cornice, and recessed storefront with pillars, plain sash windows and transoms. Alterations are centered a the storefront level. The windows were originally multi-pane. The recessed porch did not initially extend the full length of the front façade; the west end of the porch was originally enclosed. Although this early residential gable front residence has been extensively altered it has retained some aspects of its vintage form. It is also the oldest extant building in Yelm, and was Yelm’s first hotel. Originally located west of the railroad tracks where the city hall is today, the former hotel was originally connected to Robert Longmire’s General Merchandise Store and the Yelm Prairie railroad platform. The building was also known as the Rod Coates Hotel, named for a member of one of Yelm’s earliest families. Reportedly Rod Coates moved the hotel to its current location. While this vintage, gable front vernacular residence has been extensively altered it still retains some of its original style. Note the steeply pitched gable roof, shortened eaves and gable overhangs, and rustic and clapboard siding. Alterations include side and rear additions. The current front façade was originally the rear. Initially the house was located on the site of the current city hall. When the building was moved to its current location the front façade was turned towards the rear of the lot. Other alterations include the removal of a second floor middle pivot window and balcony, the removal of a first floor bay window, and the addition of a first floor porch. The current front façade’s porch columns and railing have been removed, and there has been the construction of a side addition, a new front door, and a metal porch roof.